8-room-villa, area of 1100 m² (fenced), beautiful garden, private swimming pool (10 x 4m), with built-in steps, outdoor shower, seats, patios, garden furniture, grill house, kids’ play area swing). On the premises: Central heating, air conditioning, room cleaning weekly possible, parking area, carport, supermarket 500 m, restaurant 600 m, bar 500 m, sandy beach 1.1 km. Villa 220m² 2 on 2 floor, elegantly furnished, living/dining room 40 m² with satellite TV, , 3 double bedrooms, 1 room with a bunk bed, open kitchen (baking oven, dishwasher, microwave, freezer) with dining table, shower/toilet, bath/shower/toilet. Lower level: (outside staircase) Living/dining room, ceiling height 210 cm, a bedroom with 2 beds, satellite TV. Exit to the patio, open kitchen (baking oven, microwave), shower/toilet. Moreover the guests can use an outdoor shower in the pool area! Additionally a great shady area is offered for the house guests under a large pine tree in the form of a traditional Spanish lounge. What a great place for family and friends to stay! The villa is large and perfectly laid out so that everyone had plenty of space to relax and with beautiful terraces you can catch the sun or shade at any time of the day. Pool was a nice distance from the house and very private, great temperature and lots of fun...we had a four year old with us and it felt very safe for him too. Nice walk to the beach and town, about 15 minutes, plenty of bars and restaurants although as we went late September it was quite quiet later in the evening. Lovely walks along the coast with lots of opportunities to stop and have a coffee and admire the view, the coastal train was perfect for little one too! Kitchen was well stocked with everything we needed, and shops were close by for supplies, obviously you pay more for local but there is a Lidl and Carrefour a couple of miles out of town but you need a car to get there. The villa was everything we had hoped for and made for a great family holiday, can't wait to go back...Lovely Lovely!! 8 Guests stayed at this villa in September. We had a great week. The villa was well presented and had all the amenities you need for a great family holiday. A short pleasant walk into Moraira which is a beautiful location for a relaxing break with the family. Jutta the owner was very quick to respond on any questions we had when booking this villa & we would recommend it. 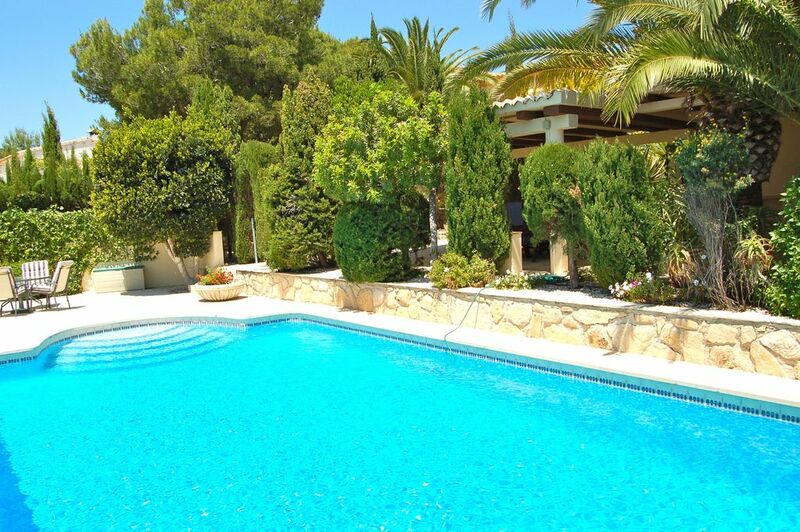 Beautiful Villa in Moraira close to beach and all amenities! Our two families (8 people) stayed in this truly beautiful villa in August this year, the Villa had plenty of space for us all and we even think we could have brought another couple to sleep in the downstairs self contained apartment and still had ample room! The pool area was clean and spacious with plenty of beds, the outdoor shaded kitchen area was perfect for lunches and evening bbq's or just to get out of the sun for a bit but still being close to the pool. We had breakfast on the large terrace table next to the house most mornings and all outdoor eating areas had plenty of seats for us all it was just lovely. The house itself was also very well kitted out with everything you could possibly need to cook/eat drink with. Lovely views from the front room. The garden even has a little swing! Moraira itself is stunning, we stayed for two weeks and still didn't see all of it that we wanted to see so we will definitely be coming back. The location of the villa is perfect it's about a 10-15 minute walk to supermarkets, restaurants and the beach, the harbour is a little further on but worth the extra 5 minutes or so. There are hundreds of restaurants to choose from! We particularly loved the ice cream parlour and cocktail bar and a little restaurant that served yummy authentic tapas!! The villa is up a hill so perhaps not suitable for everyone. Every evening there was a little tourist market amongst the restaurants and on a Friday there is a HUGE market - definitely worth a visit!! There is also a little fun fair mainly for the younger kids but worth a visit if you have a little one. The beach was very pretty and clean, with pedlows and a fun assault course in the sea for the bigger kids, it was quite a small beach with rock pools at either end to go hunting for baby crabs or fish but despite its size we didn't find it too over crowded considering it was August. Fantastisch huis, van alle gemakken voorzien. Wat een mooi huis en een fantastisch zwembad. Het huis is heel groot en mooi ingericht. Loopafstand van winkels, strand en boulevard. This villa is absolutely gorgeous and a perfect fit for a large family. Lots of different spaces (inside and outside) to relax. Next to that, the location is just perfect. Away from the bustle, but close enough to walk down to Moraira. We do recommend to rent a car to explore the coast and its lovely towns. 1. Make sure you ask for instructions. We only found out there was supposed to be an instructions guide upon check out. The host who checked us in, never presented this to us. Therefore we missed valuable information and due to this, we were charged extra cleaning charges. We have let the owner know, but please be aware. 2. The fridge in this house has been an issue and by reading other reviews, apparently this has been an issue for some time. The fridge is somehow broken and doesn't do a proper job anymore. The first days it constantly beeped, even throughout the night, which woke us up. After getting the fridge 'fixed', it leaked for te rest of our stay and te door didn't close properly anymore. We advised the owner to buy a new fridge. Thank you Steffie for the kindly words about the villa, the location and for your recommendations. We are sorry about the issues and it seems to be important to make a statement to your opinion. 1. In the moment of the renters arrival, the housekeeper always comes to welcome them personally, to give them the most important information and instructions. She always asks if you have other questions or if you need some help or something more. To be reachable for some circumstance, she gives her telephone number to react immediately and solve every problem they might have. The welcome map with a lot´s of information is always in the moment of welcome on the table in the salon. In your case, Steffie, the housekeeper found the information map after your departure under the sofa. The small part of adicional costs we asked you to participate, was a small part of the adicional costs you caused. I explained it to you before and asked you for understanding. The extra charge was for the adicional bed linen and towels you used (4 beds more) and the extraordinary cleaning after your departure. The cleaning team ordered 1 woman more than usually for 5 hours extra in the moment of entry in the villa. 2. A technician came 2 times to repair the fridge, once during your stay and once after your departure. The first time it was necessary to fill it up with gas - sorry for the annoyance of beeping and thank you for your advice to do it. The second time, the technician found out that the fridge leaked, because the drawer inside wasn´t closed correct, so the fridge also couldn´t close. After the "reparation" the technician controlled and checked everything, and the fridge is working perfectly without any problems. Sometimes, it happens. The renters do not take notice of the small details and the consequence is beeping or leaking. We are happy that you and your family all in all despite the issues you had, could enjoy your holidays and had a great time ! superbe maison typique espagnol .tres bien equipée et avec tout le confort. Nous etions 9 et nous sommes arrivées dans une superbe maison climatisée, bien située dans moraira, avec tout le confot necessaire, un jardin magnifique,et une belle piscine.Un patiot géant qui nous a permis d'etre a l'ombre a n'importe qu'elle moment de la journée. L'acceuil a été tres bien et tout etait propre a notre arrivée. le service super rapide lorsque que nous avons eu un petit probleme technique avec la piscine. rien a redire sur cette villa sans aucun vis a vis et au calme que je recommanderais sans soucis. Small, comfortable fishing village, directly by the seaside, conveniently situated, 110 km southeast of Valencia, 85 km northeast of Alicante. Situated in a beautiful bay, surrounded by a landscape with fertile fields and small traditional houses and properties. Weekly market is on Friday, every morning fish market. Inside the village: Supermarkets, shopping malls, butcher shops, bakeries, boutiques, post office, banks, restaurants, bars, discotheques, concerts, evening entertainments, museum, doctors, pharmacies. Traffic conditions: Highway AP-/, Exit Benissa in approx. 10 km. Harbor Club Nautico. Calpe in 18 km, Javea in 10 km, Benissa in 10 km. For arrivals by plane: Valencia airport (VLC) in 125 km, Alicante (ALC) in 95 km. In den Preisen ist ein Stromverbrauch von bis zu 200 kW / Woche enthalten. Bei mehr Strommehrverbrauch wird dieser mit 0,27 € / kW berechnet. In the prices is the electricity consumption until 200 kW / week included. Addicional consumption will be claculated with 0,27 € / kW.